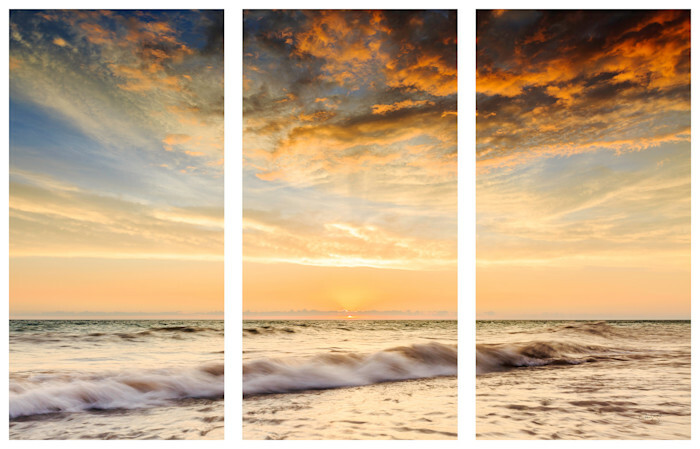 Photograph split to three panels, each sized 12" x 24" - Hung with approximately 1.5" between panels, this will cover approximately 39" of width and 24" height on your wall. Photograph split to three panels, each sized 15" x 30" - Hung with approximately 2" between panels, this will cover approximately 49" of width and 30" height on your wall. Photograph split to three panels, each sized 18" x 36" - Hung with approximately 2" between panels, this will cover approximately 58" of width and 36" height on your wall. Photograph split to three panels, each sized 24" x 48" - Hung with approximately 3" between panels, this will cover approximately 78" of width and 48" height on your wall. If a print arrives damaged, contact us immediately for a replacement. Since all print orders are custom printed to order, we do not currently offer returns and recommend that you carefully consider the sizes and media types when placing your order. If you have questions about the different print types or options, please contact us! We're happy to help you out with finding the right product for you. That said, we do recognize that sometimes when you receive a print it is different than what you expected. While we try to minimize this through the availability of our online previews and wall mockup tools, it can happen! If the print you received is not the right size or medium for your wall, contact us immediately to discuss options. In some cases we may be able to exchange it for a different size or medium within 30 days of receipt of your order. In such cases, you will be responsible for covering any price difference between your original and replacement order, as well as the cost of returning the original print to us and the cost of shipping the new print to you. In the event that the replacement print is of lesser value than the original order, you will have a credit on file to use on future orders. We will deduct from this credit (to the extent possible depending on the size of your credit) the costs of shipping the old print back to us and the new print to you and notify you of any remaining credit we will have on file for you. We provide printed photography products made in-house by Drew Smith and produced through professional photographic labs. In all cases, we use the highest quality printers and substrates available on the market. We use archival inks in our printers, archival substrates for print production, and the highest quality canvas stretcher bars, mat boards, frames, and other supplies in making out artwork. For a full description of materials used, please contact us. © Copyright 2018 Drew Smith Photography, LLC d/b/a Focus Gallery, All Rights Reserved. GET FREE SHIPPING ON YOUR FIRST ORDER! Enter your email below and we'll send you a Free Shipping Coupon right now!